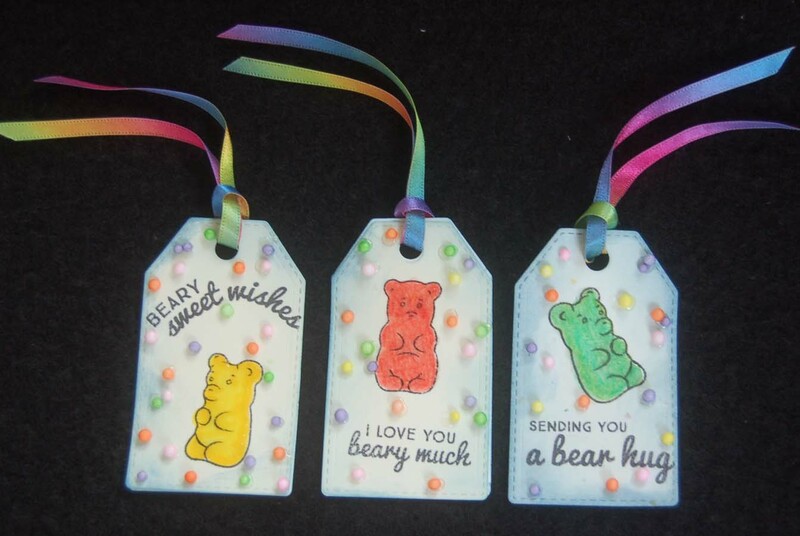 Usually I make tags with the leftovers from a card making session, but this time I wanted to test out a new stamp set (Avery Elle gummi bear) so I decided to do tags before the card. I discovered that the gummi bear look that I wanted is best achieved with color pencils covered with Glossy Accents. Copic pens have a more intense color but the ink bled through the tags. 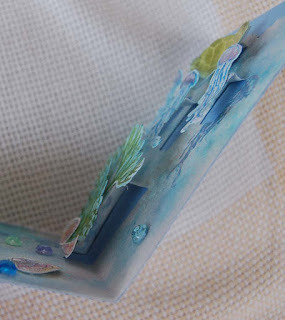 Also the Glossy Accents needs to be used sparingly or the surface will crack, but make it thick enough that it does add some dimension. Some of these supplies were used on the tags and will appear on the gummi bear card that I will share on my next post. The cute little colored 'candy' balls are from Queen and Co. and can be purchased at HM Ben Franklin Crafts. 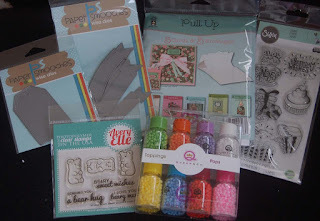 The ribbon (not shown in the above photo) used is a Heiko product from Celebrations and is probably my favorite ribbon because of the rainbow colors match with so many projects. 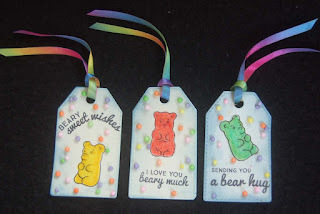 Anyway, please visit this site again to see how my gummi bear card turned out....yummi gummi sweet ! 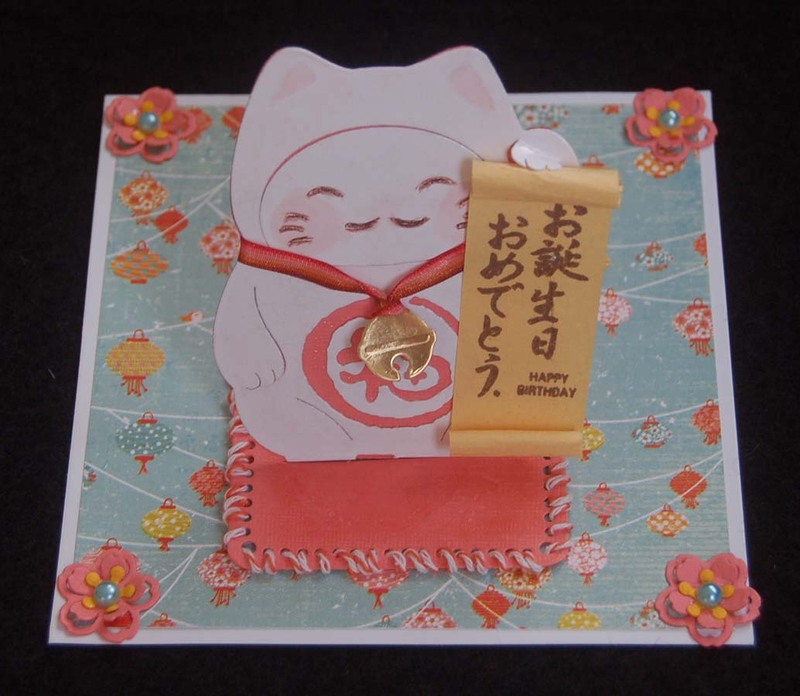 For a change I decided to make a quick card so that I could spend more time baking the treats to go with it. 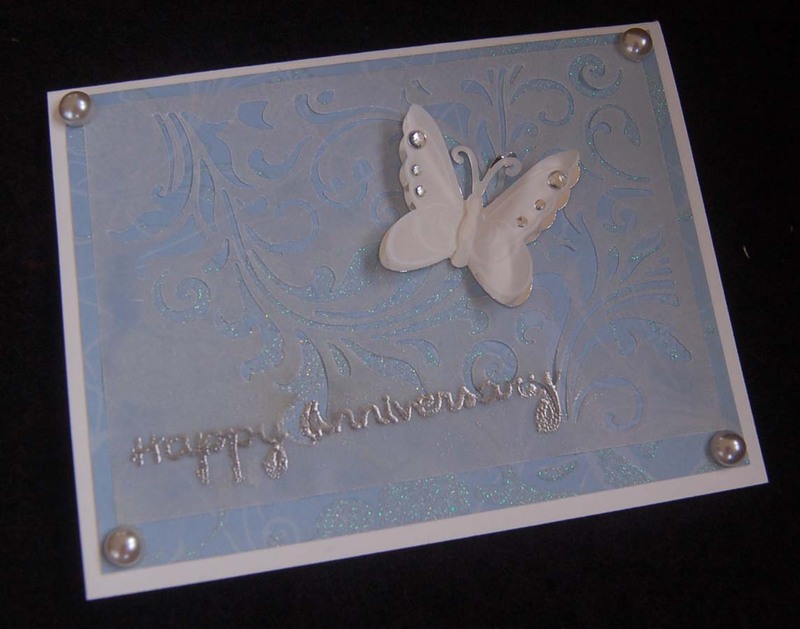 These two cards only required simple die cutting and stamping using Paper Smooches products. 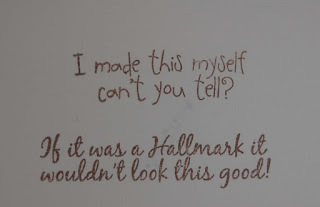 The Misti stamping tool made it a cinch to get the words stamped exactly where I wanted them to be. I was happy to use up some printed paper scraps which have been in my mile high desk pile for months...maybe years...LOL! All right now...onward to my oven to bake some yummy goodies! These Maneki Neko (Lucky Cat) cards began with a Wonder House die set that I purchased in Japan. (I think merchandise from this company is available online.) This set appeals to me because all the dies from the mat to the bell to the flowers are included. I like the first example because of the background paper which came from a Basic Grey 6x6 printed card stock pad. On this second card I decided to try sewing some twine through the holes in the mat. 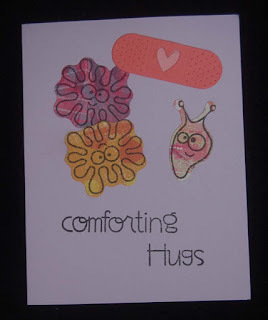 I loved the die cut flowers so much that I used them on the third card. Color-wise I liked this card the best even though the background paper came from a cheap origami pack...LOL! Because I didn't want the holes in the mat on this card, I turned the inner die upside down so the holes wouldn't be cut out. Here is a view of the back of the card which shows how the cat's tail holds up the card so it can be a tabletop display. I learned that the Glossy Accent liquid can be used as a quick drying glue that is more fluid than the 3 in 1 Beacon glue that I usually use and the Glossy Accent bottle has a fine tip too. 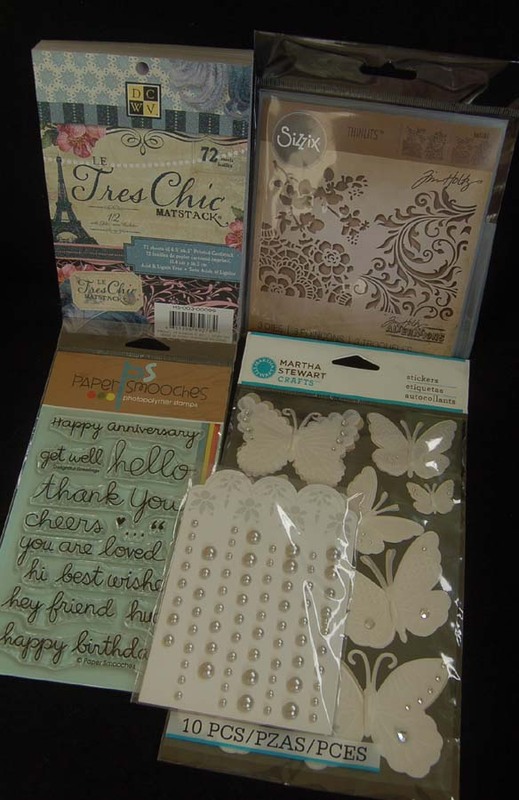 The cards and envelope for these cards are Studio G products and only cost $1.25 for a pack at Ben Franklin Crafts. 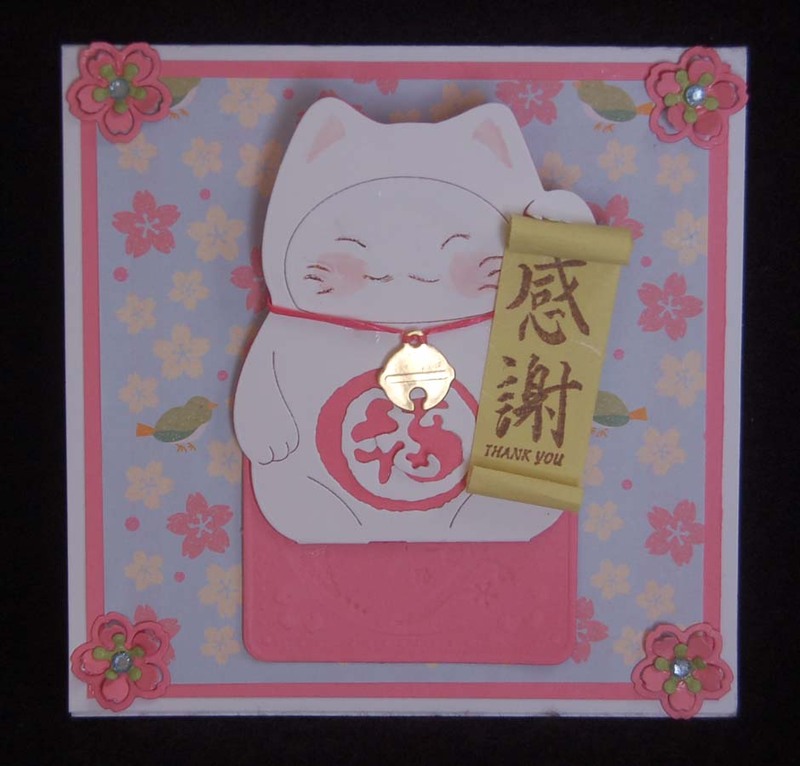 The Japanese characters on wooden handles are old ones from my collection but there are lots of similar stamps that you can purchase. In the photo above you can see that I have washi tape holding the cat and mat parts together so I don't have to align them every time I want to cut out and impress the main pieces. I hope you enjoyed visiting this blog site and will return often to see what I've created. Please leave a comment if you have some time. I love hearing from you. Mahalo! I 'found' this really cute Penny Black stamp in my birthday-themed stamp drawer and realized that it had never been inked up. 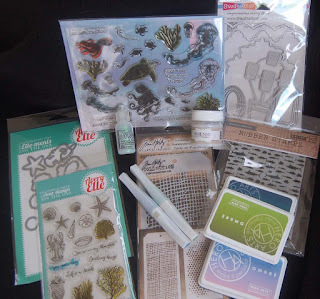 I decided to pair it with some new dies that I purchased recently from HM Ben Franklin Crafts. I love the polka dot background die (Spellbinders) because there are so many color combinations possible. 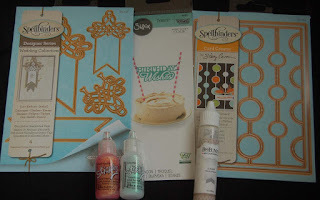 The Sizzix words were supposed to be a cake decoration but who would ever do that? 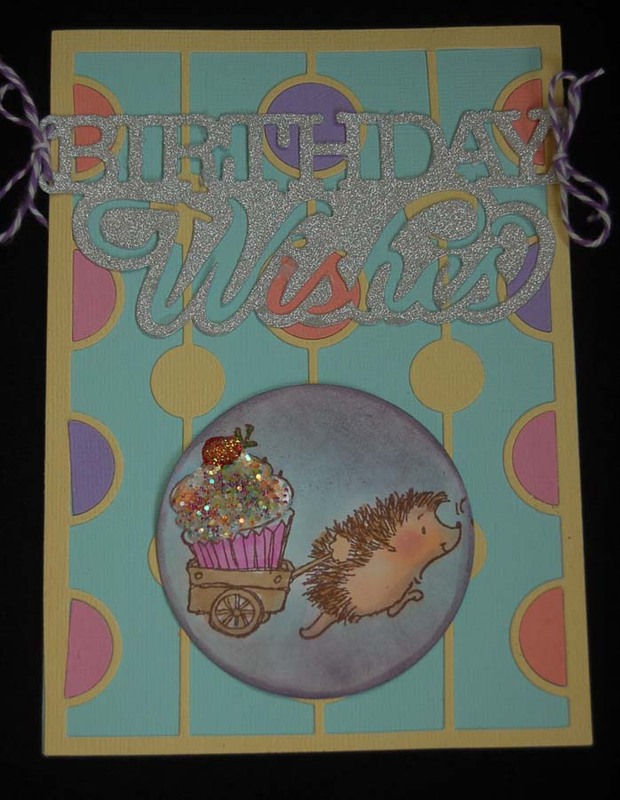 I knew that a better use for the die would be to add a splash of glitter to a card and the holes on the side were perfect place for some twine bows. The Spellbinders fancy banner dies seemed ideal for tags. 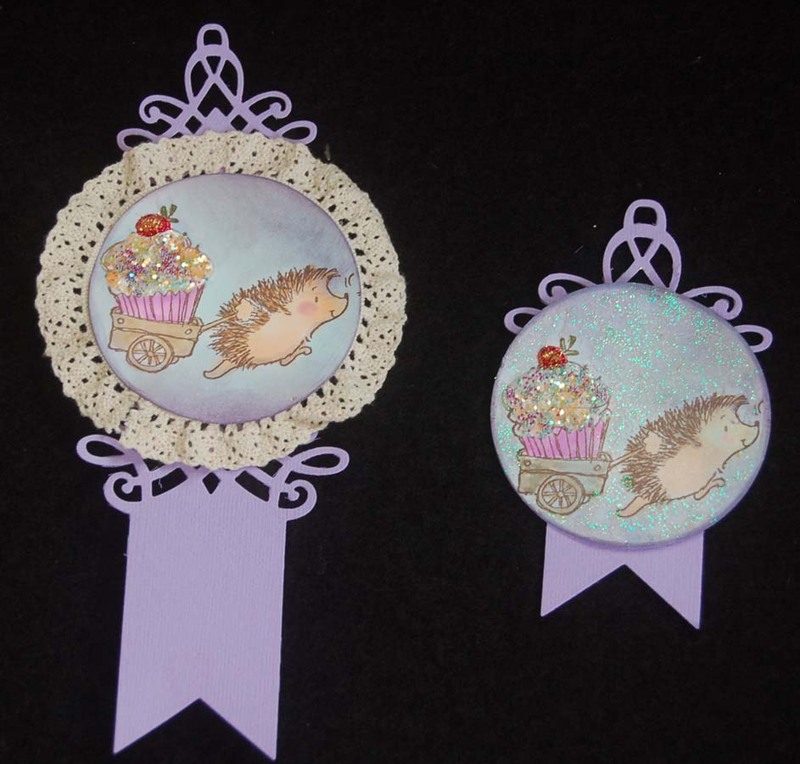 Since I had extra stamped possum images (always make extras just in case) I decided that one would look good with lace to make a tag that mimics a winner's competition ribbon. The other tag was simpler and has a space in back for a message. Bo Bunny sugar white was used to make the frosting and MS sprinkles were used for decorating. The smaller tag had some blemishes so I covered them up with clear Stickles and the pinkish red Stickles was used on the cherry. Well, that's it for today. 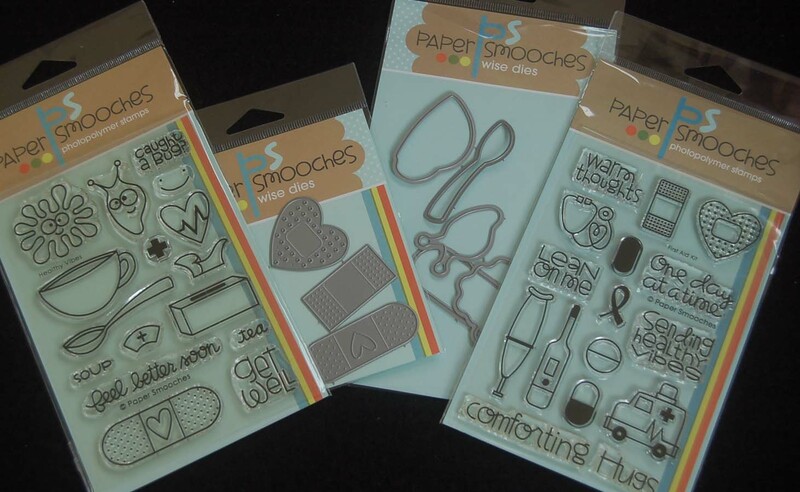 Hope that you will go shopping at HM Ben Franklin Crafts soon to checkout all the new items arriving. New craft tools and supplies always seem to inspire creativity. Get inspired today at HM BFC! As promised, here is my 'all white' card....LOL! I couldn't do it! 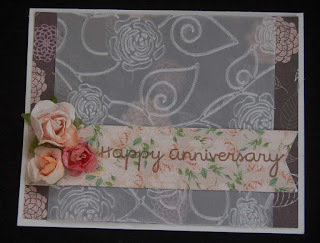 I needed an anniversary card for my husband, but all white seemed too weddingish, so I paired brown and pink. 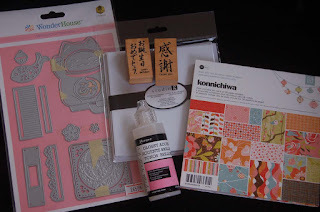 My husband is a brown leather kind of guy and I am a girly pink person so I thought these color choices would be perfect for a card celebrating our anniversary. 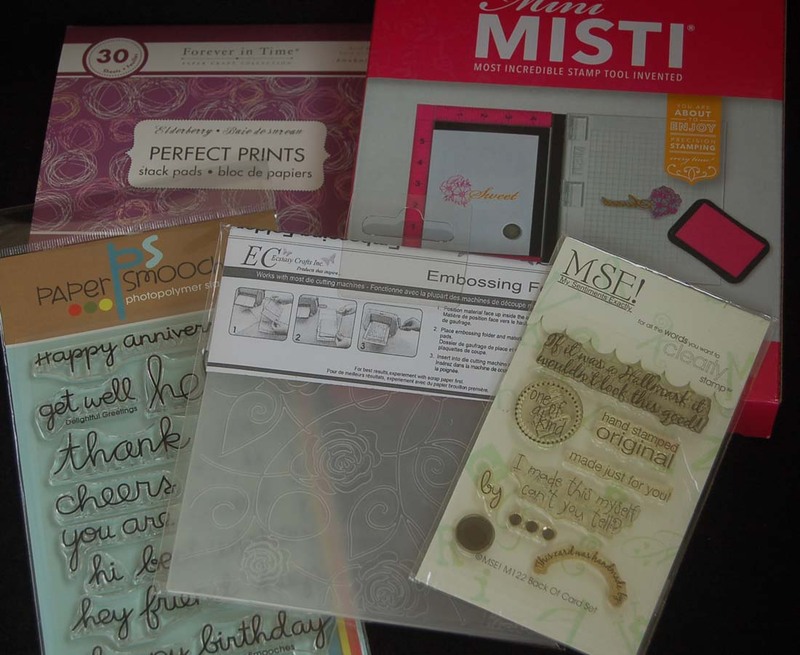 Mostly, I wanted to feature the Ecstasy Crafts embossing folder with the rose pattern. 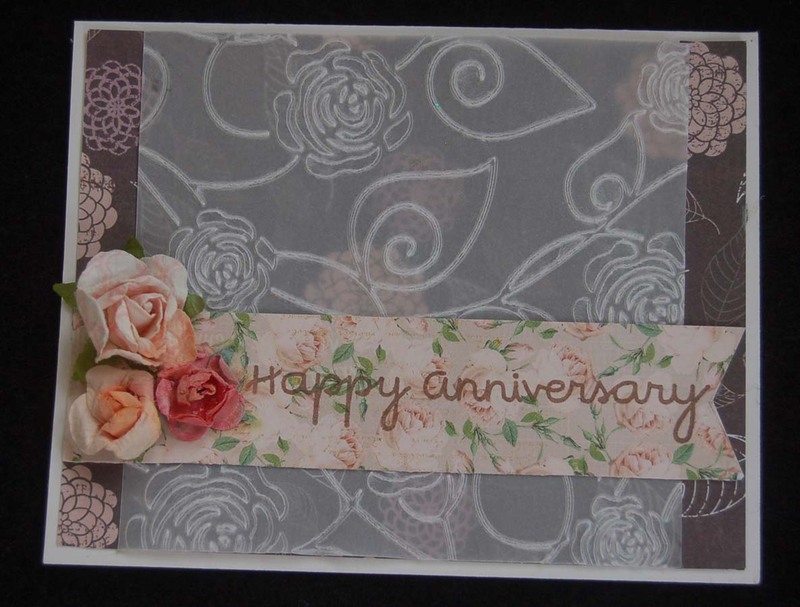 I really love the way vellum looks when it is embossed so I simply layered it over a floral patterned paper from a Multi Craft 6x6 paper pad. I hand cut the banner and stamped it with a Paper Smooches sentiment using the Mist tool to center the words exactly on the banner. Adding a few paper roses finished the card off in record time. 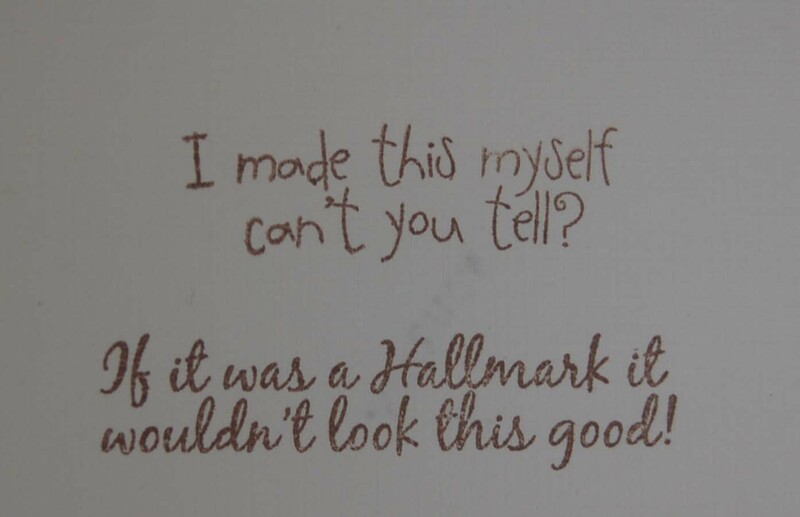 For a bit of humor, I stamped the MSE (My Sentiments Exactly) words on the back of my card. 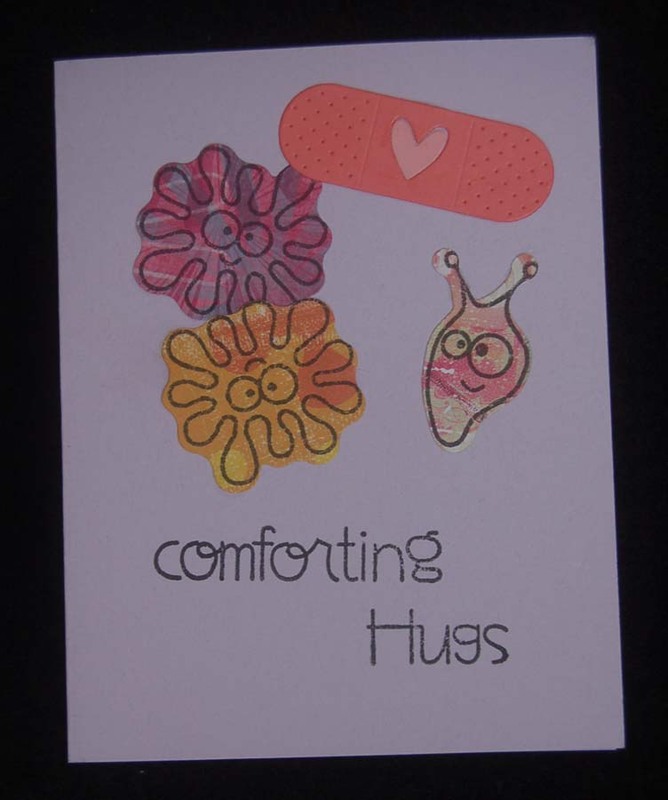 I often use this stamp set to express and emphasize the care and love that goes into the cards I make for close friends and family. Gotta make sure the cards don't go into the trash after a week....LOL! For those of you who are interested in the answers to what was in my photos shown on a previous post: 1) tomato server (in Victorian times tomatoes were exotic so special implements were designed to serve them) 2) candle snuffer (the box part extinguishes the flame and the pointed part probably was for lifting up the wick) and 3) quahogs, cherry stone, or steamers. Sadly, no one guessed any right answers so I suppose the contest was too hard. I love poop-up cards, but I'm not much of a paper engineer so when I saw the Stampendous Build a Pop Up die set selling at HM Ben Franklin Crafts, I immediately bought it. The die set shows the pop-up used to make a floral card but I decided to make an ocean-themed one since I just purchased sea creature stamps and dies. 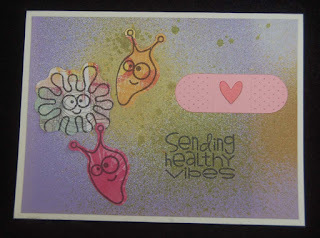 The inside and outside of this card began with Distress Ink applied to watercolor paper. 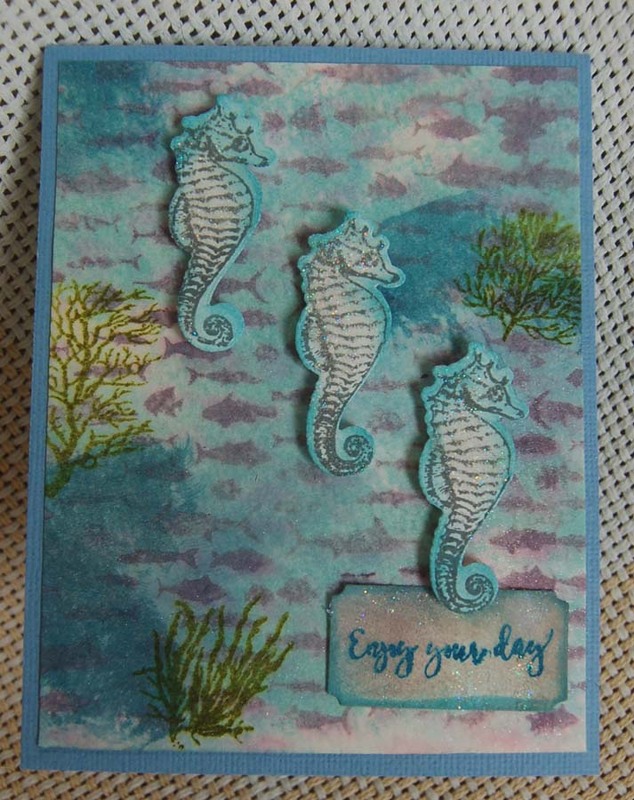 For the card front I stamped a Hero Arts fish background and some seaweeds before adding the die cut seahorses (using foam dots) and the sentiment. 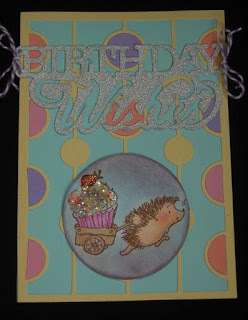 For texture I applied Bo Bunny Glitter Sugar Paste over a Tim Holtz stencil. This look is very appealing to me and can be seen in one of the close up photos. 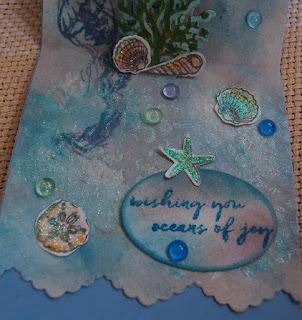 I used the scallop edge die (comes with the Stampendous set) and pop-up die to cut the dyed watercolor paper inside the card. Then it was simple work to tape the images (using Heiko double stick) to the pop-up platforms. 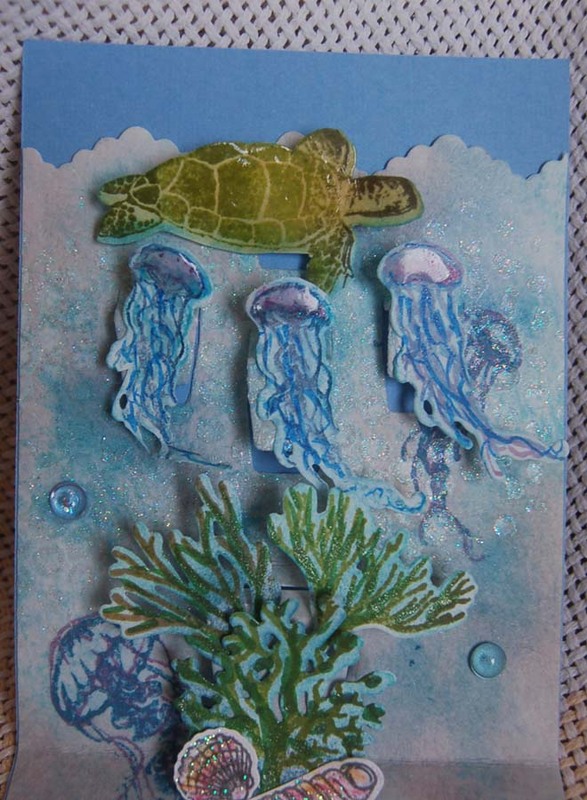 The turtle and jellyfish were enhanced with Crystal Accents and the seaweed/shells were highlighted with Wink of Stella or Scribbles. 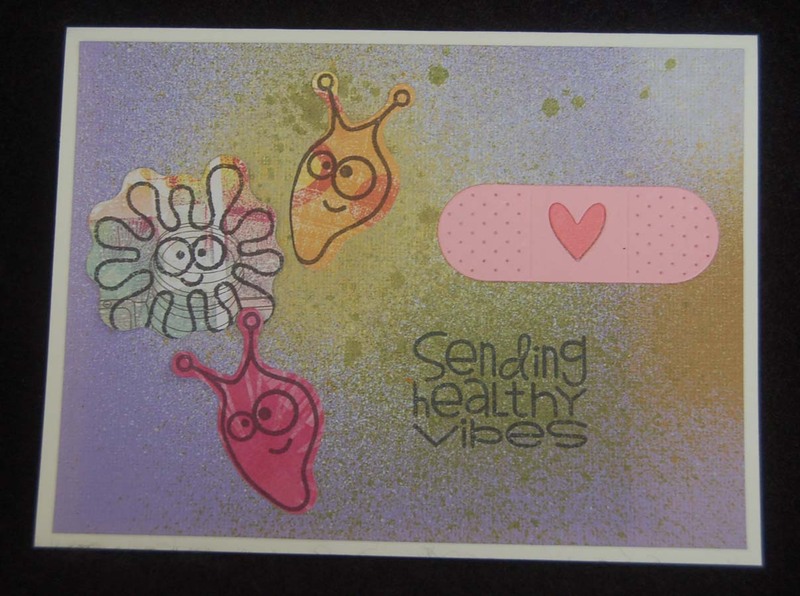 This photo shows how lovely the Crystal Accents looks over the images that were colored with Hero Arts ombre inks (nice to have three shades in on one pad). 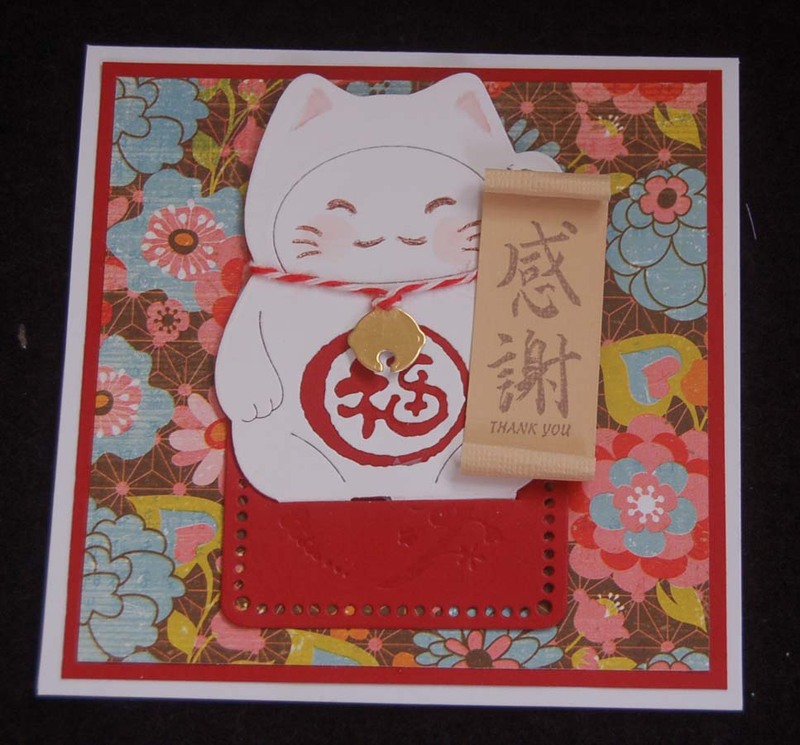 Several sentiment frames come with the Stampendous die set so that is an extra bonus. 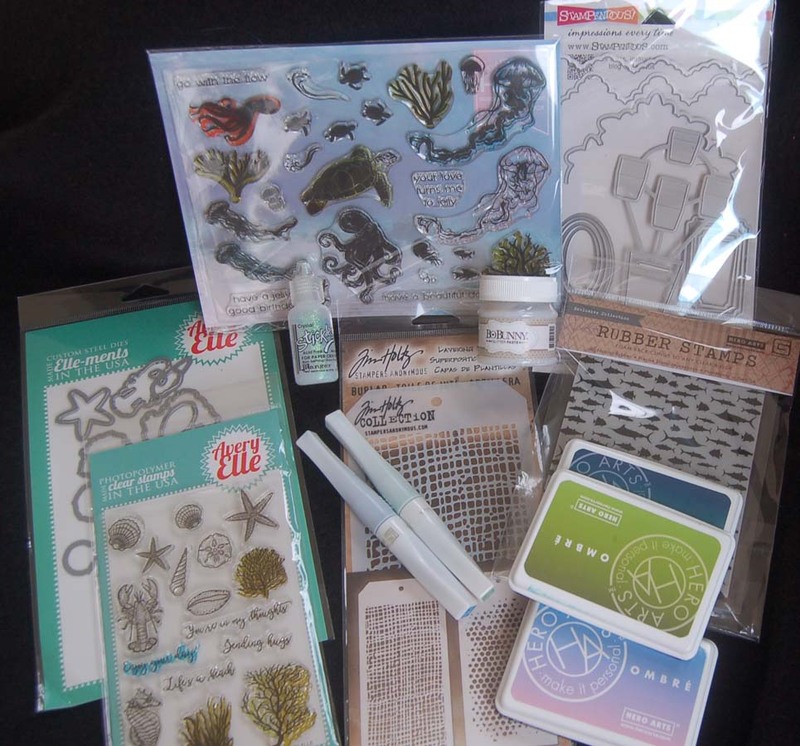 The acrylic dots were sold at BFC awhile ago in the home deor area (not sure if they still have them). 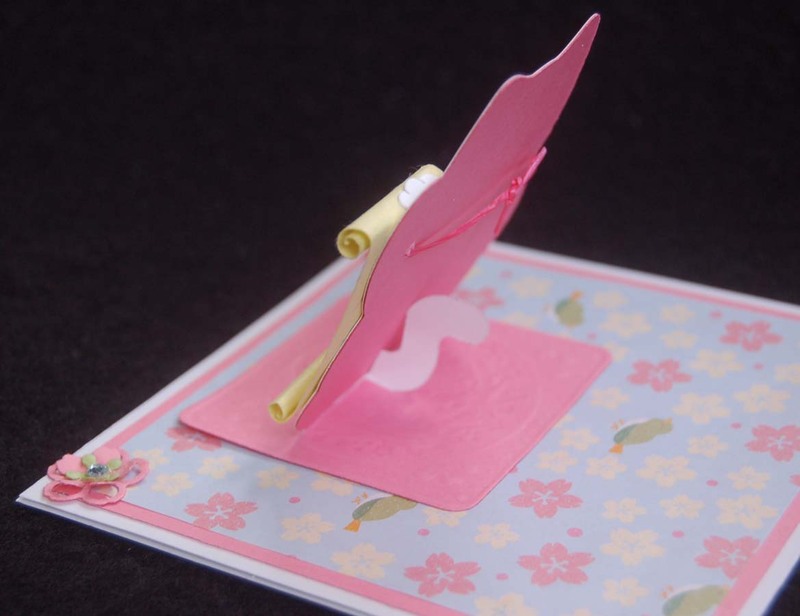 Here is a side view of the inside of the card which shows the die cut platforms. This type of pop up card is less thick than those made with foam dots so the card fits better in the envelope. All of the stamps and dies I used on this card came from either Hero Arts or Avery Elle (sold at BFC). One of the sentiments was from a set not shown. Sorry for the glare on the Stampendous pop up die set. 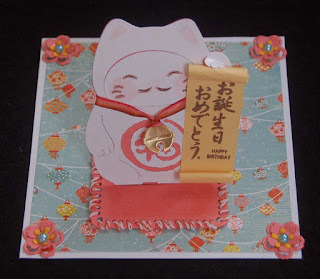 I truly enjoyed making this card because it was so easy and the result made me visualize other cards to create in the future. Recently, we took a trip to the east coast to visit my son. During our free time I love to search in antique stores for treasures. I particularly love silver implements, tea paraphernalia, Victorian dishes/jewelry. On this trip I found two very unique silver pieces. I thought it might be fun to play a game with my blogland friends. All you need to do to is send me (lsakami@aol.com) a guess of what you think each piece is and you might win a bunch of crafting goodies. 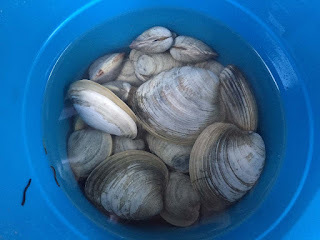 We also went clamming on this summer trip and actually found lots of delicious clams on a beach near Cape Cod. If you can identify the two types of clams in the photo above, you might also win some cool stuff. Don't worry if you can name only one thing because sometimes no one gets the answers right to my odd questions so the one with the most correct ones (four max) will win. Go ahead and guess. You have until August 10th to submit your answers. If there are ties we'll have multiple winners. Good Luck!